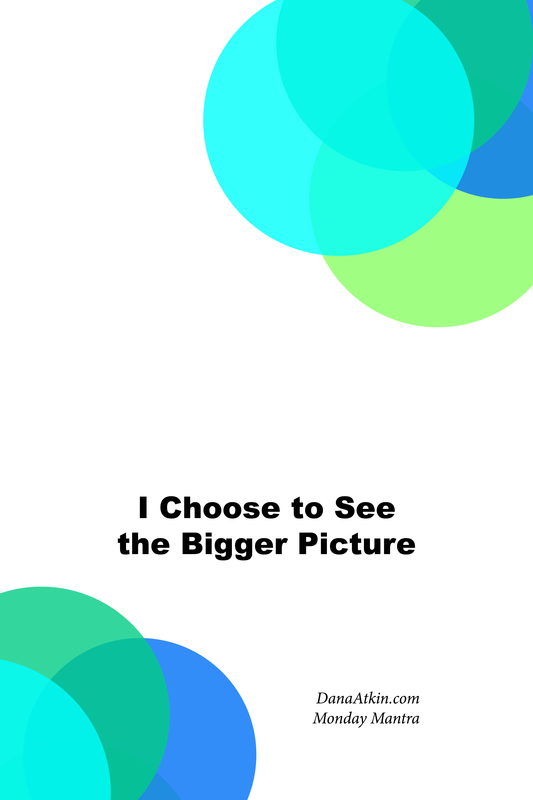 I choose to see the bigger picture. I choose to see the bigger picture because it gives me a chance to choose a happier thought. It gives me the option to look at all of the elements involved before getting upset or angry about something. I chose this mantra today because I realised this morning that not everyone sees the bigger picture. Some people only see the details of the ‘right then and there’. There is of course no right or wrong way, it’s entirely up to the individual’s perspective but the difference it can make in how you feel and the thoughts you choose is pretty amazing. What brought this up this morning was a minor thing. A simple “hey, you forgot to get this from the supermarket” kind of remark. But I found myself thinking “but wait, I did the groceries, chopped vegetables and cooked for 3 hours yesterday so you have dinners for the week while I’m working late and all you can see is that I forgot one thing from the supermarket?”. 2. Am I looking at this in its entire context or bigger picture? Choosing to see things in their context can often result in less stress for both yourself and any other people involved. As always, download and save the image to your phone, desktop or print and pin it somewhere and when you see it, say it and If you think someone else you know might benefit from this mantra, share it.